So as of next week I shall try my utmost to start cooking lighter, springy-er and hopefully healthier meals, if you have any suggestions feel free to comment below. I could really use the help! This is a bit of an anything goes recipe, the ingredients above are simply our preferences, you can pretty much add any veggies that you have lying around! I start off by frying the beef gently for a couple of minutes in a tablespoon of plain flour, just to seal the outside, but not cook it all the way through. You can skip this step but I have found if slow cooking sealing the meat first stops it from just disintegrating in the stew. I then chop all my vegetables roughly, I like a lumpy rustic style stew with big lumps of root vegetables in, but you just chop how you prefer it. I throw all of the meat, veggies into my slow cooker. 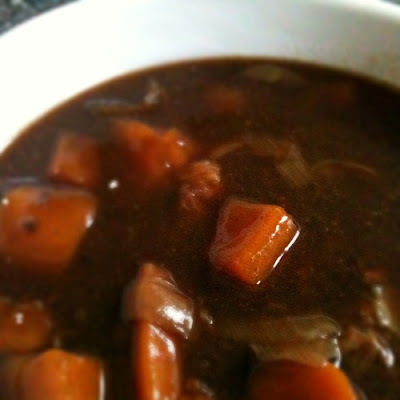 I then make up 1 pint of beef stock using a couple of stock cubes. and pour it into the slow cooker. I then top up with water until the ingredients are fully covered. I then turn my slow cooker onto low and go about my day. As I am normally at work the stew cooks for around 9 hours on low, when I get home I give it a good stir and then start to add seasoning. A pinch of salt, some black pepper, maybe even some paprika! Anything goes. Once it is seasoned I then mix my cornflour with cold water and mix into a paste, then add it to the stew and stir. The stew should thicken pretty quickly. you can add more of less flour mixture depending on how thick you would like it. Sometimes if I am feeling a bit lazy I add a few tablespoons of beef gravy granules too, this adds a richness and beefyness which the boyfriend loves! I serve with crusty bread. The ultimate comfort meal and so easy! As an added bonus it also makes your house smell amazing! I love coming home to the smell of freshly cooked stew bubbling away. So, how does your cooking change in spring? Do you opt for lighter meals? Perfect timing! I'm looking for some slow cooker recipes to get me going with the one I got for Christmas - it's still sat in it's box, ooops! I only ever tend to make variations of this to be honest, or soup. I have a beef and pearl barley stew in mine right now, I love coming home to a ready made meal!